Elisa is the hero of her country. She led her people to victory against a terrifying enemy, and now she is their queen. But she is only seventeen years old. Her rivals may have simply retreated, choosing stealth over battle. And no one within her court trusts her-except Hector, the commander of the royal guard, and her companions. As the country begins to crumble beneath her and her enemies emerge from the shadows, Elisa will take another journey. With a one-eyed warrior, a loyal friend, an enemy defector, and the man she is falling in love with, Elisa crosses the ocean in search of the perilous, uncharted, and mythical source of the Godstone's power. That is not all she finds. Blurb: A second book that isn't terrible?! WHAT?! Review: I LOVED this book. Did I love it as much as the first? No. But that's okay, 'cause I still loved it. I loved how we are introduced to a bunch of new characters, while still getting to meet some old ones. Rae is a brilliant character creator, and I loved each and everyone of them, even the bad guys. I also though she did a great job of portraying Elisa as queen. Once again, Rae doesn't stand for the typical YA novel. Oh no. Because what's really interesting is that Elisa is not a very good queen. The people are rioting up around her, and for good reason! 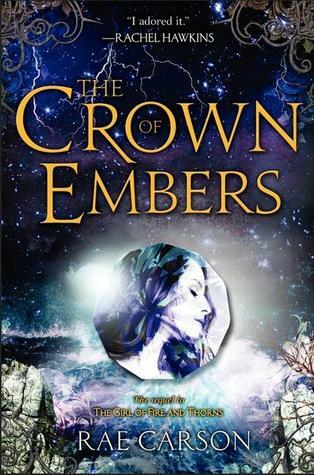 But what makes this book truly magnificent is Elisa's journey to self-discovery and finding out how to be a good queen. I wasn't a huge fan of the romance in the book. Yes, it was better than most romance books, but there was something that really bothered me... HUGE SPOILER! Do not read unless you have read this book already! Why did it take so long for Elisa to decide to marry Hector? Why did she spend the whole book saying things like "I can't marry him." And him saying things like "We can never be together because I'm your subordinate." And then at the end Elisa says "The only way to fix things is to Marry Hector!" WHY did it take you so long to reach that conclusion?!!? But overall, this was a great follow-up to a great book, and I cannot WAIT to get my hands on the third! Hahaha! We had a similar reaction to the romantic storyline... but it's because their marriage wouldn't have been strategically sound until the end of the story (after a bunch of stuff had come to pass, and alliances of the border countries had changed). Anyhoot, yes, we ADORE this book (more than GOFAT, actually) and cannot freaking wait (but have to, WAH!) for THE BITTER KINGDOM.